The fashion world needs Jeanne Bice, founding designer and pitch woman of QVC's Quacker Factory empire. She chatted with me about her love of pink and her inspirations. Fashion has been such a drag lately. Stick figure models stomping down the runways in shapeless shrouds of black and gray, looking for all the world like the walking dead. Depressed designers are killing themselves, while others extol the virtues of fascism. That's why the fashion world needs Jeanne Bice, founding designer and pitch woman of QVC's Quacker Factory empire. Let the hoity-toitys of the world preen in their Prada, small town big girls all over America are joining Jeanne's army of "Quackers" in droves, and you can bet your bippy they're having way more fun. How could they not, donning her insanely colored muumuus and twin sets, appliquéd within an inch of their life in pink flamingos, leaping kittens, or sequined strawberries. Her clothes are like that '70s critter-themed kids line, Garanimals, but for Grannies, or the poor girl's Jeremy Scott. Because of these kooky creations and her ebullient television persona, Jeanne Bice has become the Coco Chanel of the sweatsuit set. And Bice is quacking all the way to the bank. She chatted with me from her home in Boca Raton about her love of pink, her inspirations and amazing second act as the Quacker Queen of QVC. Your headband is your signature look, as iconic as Karl Largerfeld in his sunglasses or Anna Wintour's bob. How did you happen to adopt this look? I was in business with this gorgeous woman, and people would call up but didn't know my name, they would just say "I want to talk to the fat one." So I had to figure out how to stand out some other way. If I'm not gonna lose the weight, well then I'll just decorate it! So when I moved to Florida and the humidity hit my hair..
Oh wow so it's practical now I like it even more! Yup, it holds back my hair, and even my wrinkles and now people point and say, "Oh wow you're her!" I'm recognizable. What's with this company name? Do you have a thing for ducks? Ha, no. My husband and I had a retail store in Wisconsin, The Silent Woman, because the one time women are quiet is when they are shopping. One day I said to my son "This business is driving me quackers." So we went into business as Quacker Factory. I had thought of all these gorgeous chi-chi names, like J.B. Duckworth and R.J. Sweetwater. I was born on a farm and always wanted to be chic, but the name that stuck with me was the kitschy name, not the chic one! Sixteen years later, and now your company is worth 50 million? Yup. But to look at me, I'm every woman. Im older, Im overweight, I could be your mother, your grandmother. I listen to people who say, "my husband was laid off at 52, he's overqualified, he'll never find work." I am the wrong person to tell that story to. I didn't get my dream till I was 60. Your attitude certainly helps. You are eternally chipper. You can sit around and rot and say poor me, but then that's all you'll do. You'll never build anything that way. If you believe you're poor, then you are. There's a sign hanging over my bed on the ceiling that says, "The secret to having it all is believing that you do." I have worked very hard in my life, 18 hour days and it didn't get me bupkus. The day I started believing I could be wealthy was the day I started making money. Donald Trump never had a poor thought in his life! Ha ha no I don't think so, not even as an infant. How has having money changed your life? I can go to the mailbox now and not be afraid! I can pay my bills. There were years I didn't want to open my mail! What inspires you? Do you pay attention to current fashion trends? No! But sometimes I fall into them accidentally. Everything inspires me! I read every magazine and book, see every movie, follow all designers old and young. There aren't a lot of original thoughts left in this world, we all share and use each other for inspiration. My customer doesn't care if they are at the hip edge of style, or if I'm doing animal print just as long as when she walks out in it, her friends say you've got another Quacker on today, you look so great. What advice do you have for people who are afraid to wear color, like us black-clad New Yorkers? I don't mind all black as long as it has a lot of fun thcotchkes on it. Haha! Believe me, at my size I like black. But at my age if you don't put some hot pink on now and then, youre in trouble! It's not so much the clothes but the New York mindset. I feel sorry for you people when I go there. You all have to keep moving, boom-boom-boom, no one talks to each other, no one smiles at each other. Slow down, take a deep breath. What does it take to say thank you or hello? It's free, doesn't cost a friggin' dime! Or to say, "Boy, do you look pretty today." Do you think the fashion world is ridiculous, with their size zero, and smaller? When I got into the biz, size 10 was the average. Now it's a 14-16. As much as Rachel Zoe says you have to be thin, look at America. We are all getting bigger. I'm not saying it's healthy, its just a fact. Ive been heavy all my life, but it didn't slow me down any, so it didn't bother me. What do you make of the John Galliano and Dior brouhaha? I don't know what you mean. Did I miss something? I love that you don't know this story. Galliano was caught on video fighting with people in a Paris restaurant, saying "I love Hitler" and "People like you should be gassed in an oven." Dior has relieved him of his duties. Oh my God! Wow. I really think we have got to get over ourselves. We are all just people. Many years ago I was asked why I didn't do Chanukah sweaters, as I did Christmas ones. I did them before but they didn't sell. But I got called Jewbacca, and they said that I was anti-Semitic. People please, ALL my friends are Jewish! You live in Boca Raton!! You are probably like one of 3 Christians down there. Ha ha yes it's true I'm the minority. We are all created equal. What is wrong with people? We are all trying to get through this life every day. Why can't we just get along with each other? Nobody should say they like Hitler, that's just ridiculous. If you don't respect each other, you don't respect yourself. You have been poked fun of on MadTV, and by Joel McHale on the The Soup. Does that bother you? Love him! Joel has always picked on me, but with love. MadTV are mean, but Joel has never been cruel or said anything untrue about me. I have my Soup award over my office door. We can all tease each other, I don't take myself too seriously. 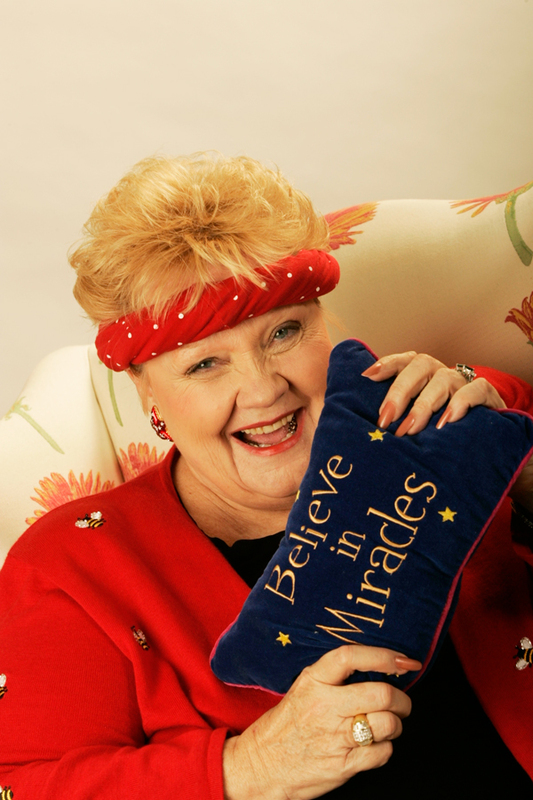 Im a 72-year-old overweight woman who wears funny clothes and a headband for God's sake! That's funny!